Are you looking for best Color Palette Generator? Here you will find list of Color Palette Generators. However, it’s not a simple work to come up every time with an appealing color scheme.To create a right color scheme it may take your hours as it is important part of design project. Hence, with view to take you out of this awkward situation. 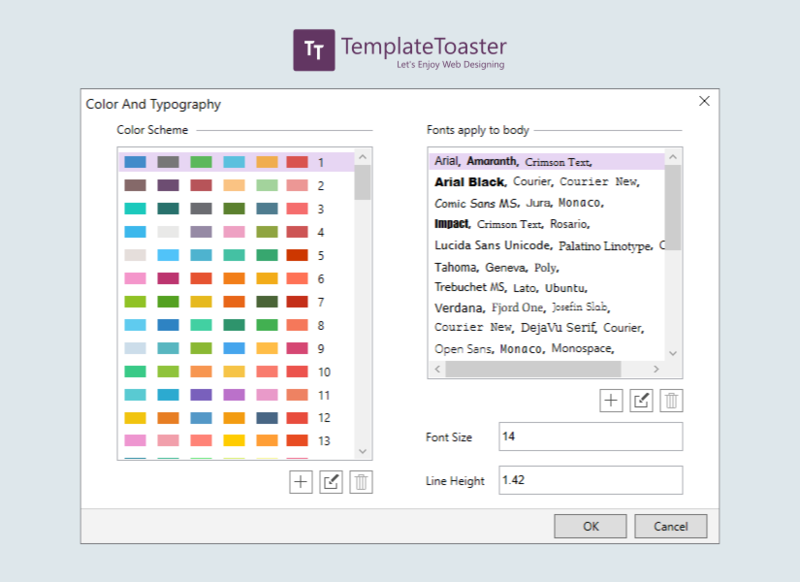 Templatetoaster website design software showcases, the list of color palette generators that will help you to create color palettes for your projects and also check out the list of best web design softwares. check out the best color palette generator. Coolors create beautiful, slick and superfast color schemes that work together. You get color codes that make it easy to find color. It enables you to export or save color palettes as SVG, PNG, SVG, SCSS or COPIC. You choose the starting color from image and rest it will provide you the perfect color combination. It is as easy as pressing the spacebar and work is done. You can create profile and keep the colour palettes collection well organized with name and tags. Coolors has three month trial duration. It has app for Android or iOS. Moreover, it comes with an Adobe Photoshop and Adobe Illustrator plugin. This is famous among all color palette generators. Paletton was earlier called as “The Color Scheme Designer”. It is one of the famous color scheme generator for picking a color palette that does not require much effort. Every scheme is based on one color, that is combined with other colors to give the best visual impression. It has a myriad of customization options that work amazing in creating color schemes. It can generate a unique palette from scratch or use predefined options. It provide you 24 preset effect like shiny, dark neon and bright pastel. Moreover, these can be tweaked to make new palette. When tweaking is done, you can export your palette in several different formats like PNG, SCSS, PDF, SVG, CSS code or copy the permanent URLs. The most appealing feature of the color scheme designer is the live sample of color scheme you generate. You can begin with selected color scheme types such as free style, monochromatic, adjacent, triad and tetrad. If you are beginner basic colors theory is the best option and on the graph you can explore new palettes. Adobe Color CC was formerly known as Adobe Kuler. Adobe has recently renamed it as Adobe Colour CC. 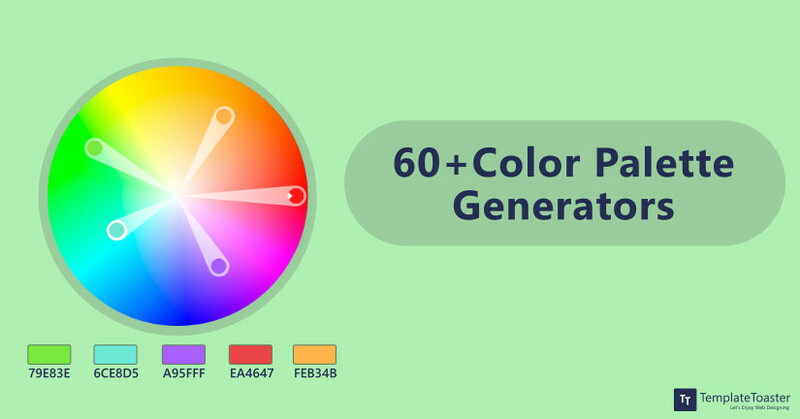 This advanced color combination generator can create various colour schemes with the spin color wheel, each one consists of a set of five colours. It allow users to save their palettes and directly upload palettes as swatches to their CC programs. If you are not able to choose right color scheme, click on “explore” and browse themes lodged by other designers. The software has the Kuler design community that allows to share your own palettes. 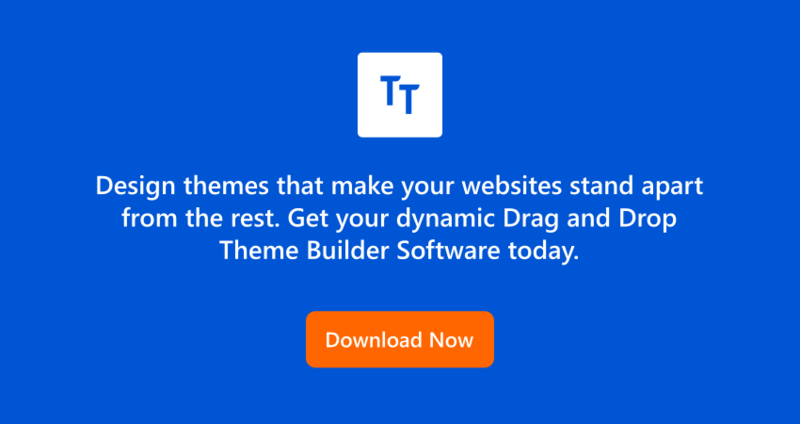 Templatetoaster website builder has tons of pre- built color schemes and they are based on Bootstrap. You can scroll to see all colour schemes. When you click on “+” button the more color schemes dialog box appears. It has primary, secondary, success, info, danger, warning colors to create new palette. It allows you to create as many palettes as you want and save them with unique name. Its color picker includes dropper, ScRGB, sRGB, Hexadecimal and transparency.This software can fill your two needs with one deed. Surprised! Yes, you have heard right! It can also helps you create awesome looking website and also has pre built templates that look quite fresh. So,you will not require any additional plugin for color scheme. As they have been around for a while and their millions of users prove that they are the top dogs of the web design industry. Mudcube is a sophisticated color palette generator with large sliders for a more granular control over your color palette. It has 10 harmony presets, 9 vision presets and 3 quantize presets. 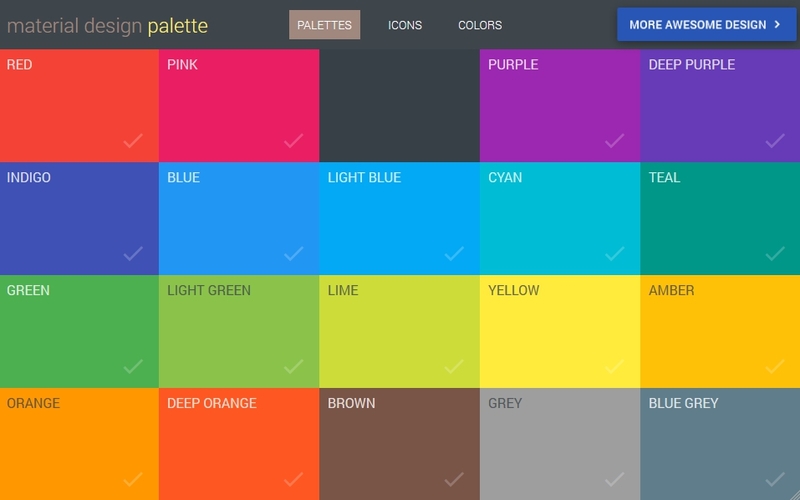 If you are not able to decide color scheme than this color palette generator is for you. It has a selection of themes from a drop-down menu to choose from. You can download your palettes in .AI or .ACO files. Further, they can be directly uploaded either was known as Adobe Kuler. was known as Adobe Kuler. on Photoshop or Illustrator. Color picker is created by dixon & me. It is so easy that you select color from selector and the rest work is done by the web app. With this cool color palette maker, you can experiment with different harmonies like full HEX, HSL, and RGB info. These values CMYK, RGB, etc will help you to find particular color from swatch. When you click the swatch it will be added in your palette. It is a wonderful tool since color palettes get exported as raw CSS or Sass code. 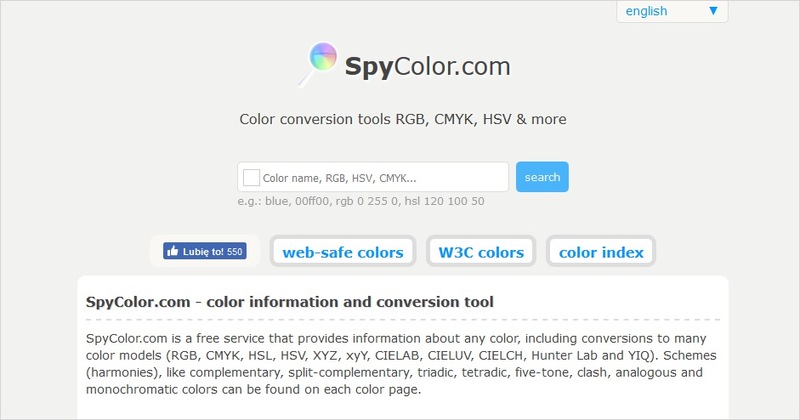 SpyColor.com is a powerful color information and color conversion tool . You can type anything that comes to your mind and its color search will suggest you the best result. The detailed information of colors and colors model is provided by this elegant colour palette maker. On each page, you will find colour schemes like split-complementary, tetradic, five-tone, clash, triadic, analogous,complementary, and monochromatic colors. If you like the particular image and interested in experimenting with color of image then color hunt is your man. It will create color palettes from chosen image. On the other hand, if not interested in generating your own palettes then you can find palettes from their archives. Ambiance color palette maker comes with pre made palettes and these palettes are pulled from colourlover. This palette generator’s huge color cards display is a definite plus, making it easier to see how well your colors complement each other. It saves colour to your own profile and create color palette from scratch. The jewel in the crown is the cleanness of the interface. 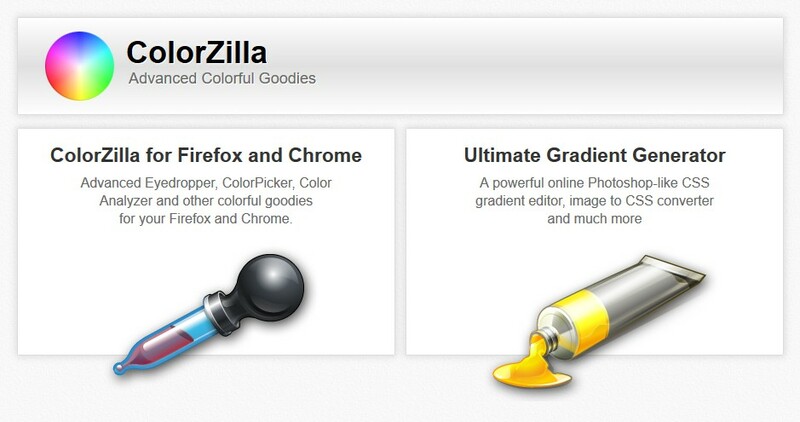 ColorZilla allows color sampling from images loaded in separate tabs and also allow sampling from local files. It is a perfect color scheme designer that contains palette browser, website color analyzer, color picker, history palette and eyedropper. There are tools to analyze the page, inspect color palettes, to create advanced multi-stop CSS gradients, as well as to get a color reading from any point in your browser. Colormind grasp color styles from movies, art and photos. Then, it creates color palette. Random color schemes is generated if no colors are locked. On the other hand, if you want particular starting color, choose that color and lock it. It is a refined color scheme generator which generates triadic and other complex color schemes. 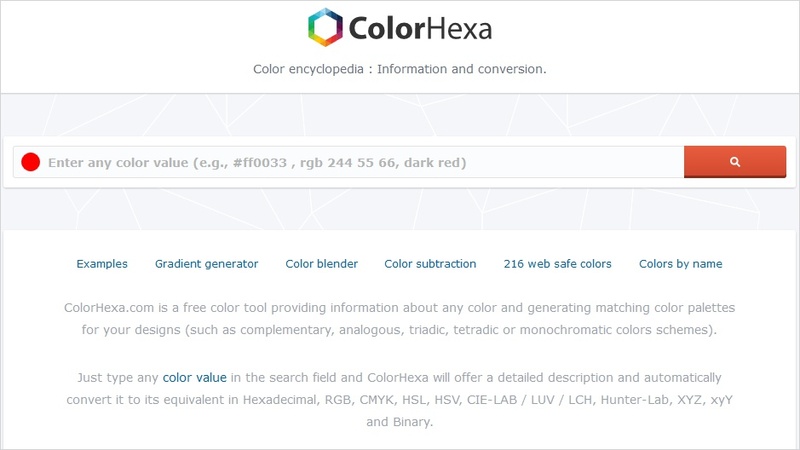 ColorHexa offer tons of color related tools for designers.You put a color value into the search bar and application display the information related to color schemes,alternatives, tints, tones and more. It has full screen display, it helps to view how well colors complement each other. 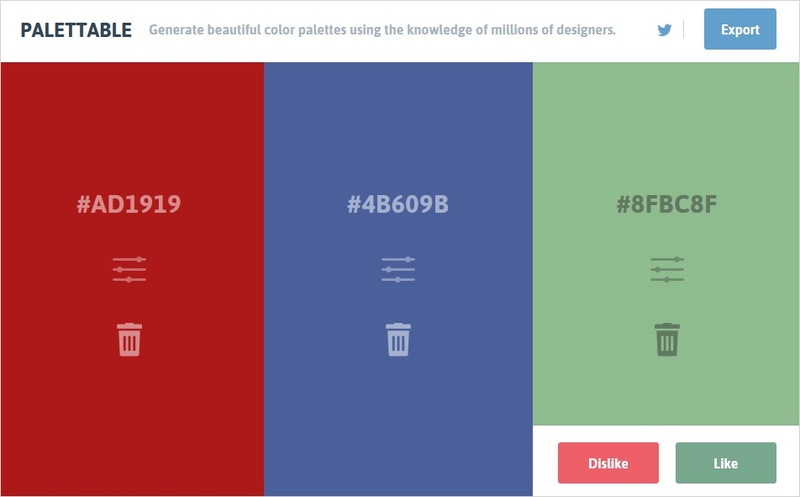 Palettable is an ultimate color combination generator that create palette using the knowledge of thousands of designers. The tool offers you suggestion for various colors that you may like or dislike or customize via block. Canvas colors let you know everything from color, their meaning, numerous color combination. Canvas is a color palette maker that has hundreds of pre-set color combinations, along with clear descriptions about colors and their various color combinations that can capture you for hours. Colordot by Hail Pixel continuously generate color swatches until you get the palette of your choice. You can generate color palette from scratch as you move cursor on screen to nail down your chosen colour .You just have to click, to save the color and work is done. It is the easiest color scheme generator. In Material Palette, you need to pick any two colors from the tiles given. Then application creates color palette. Colour scheme generated by this software can be tweeted or downloaded . COLOURlovers is mainly an online community-based website. The highlight of this color scheme designer is that it offers page after page of gorgeous color schemes, shade variations and pattern templates to make your product more colorful. Colours, palettes and patterns are user generated. You can also share your palettes. This magnificent color scheme generator does not consist of preset options to was known as Adobe Kuler. was known as Adobe Kuler. was known as Adobe Kuler. was known as Adobe Kuler. was known as Adobe Kuler. was known as Adobe Kuler. was known as Adobe Kuler.help you in color generating but, it lend 12 similar colors next to the base color you are working on. Color lover is hub of colors and palettes ideas that you might have not thought. The website provide free membership. Pictaculous works with images and lets you extract colour palette from the given image. So, you have to upload an image to get a color palette. It pulls in color scheme suggestions from the communities at Kuler and COLOURlovers. Each image is processed on the backend to get the right colors combination. Afterwards, it creates an Adobe swatch file so that you can download color palette. Kim jensen created colorexplorer as a spare time project. Colorexplorer is all about working and exploring with colors. There are tools to upload CSS and HTML files, tools to evaluate and work with colors from an existing website, color matching tools offering you a large number of matching algorithm including the most famous theoretical and scientific model. Its advance color picker tool to help you with 6- way colorpicker to adjust a color in a preset steps, as well as it has a magicmatch and color conversion tools. Colors on the web is an innovative among all color palette generators it gives you starting point from where you get ideas for color scheme and color inspiration. The Color palette generator tool is mainly about the color theory and the use of their in the web designing. The site provides better understanding of color theory and the importance of colors. When you run out of idea and need something new to generate it renders you color combinations to work with. It has amazing tool “contrast analyzer” it lets you know whether two colors meet the accessibility guidelines defined by the W3 consortium. Colormunki is online colour calibration tool, to help confirm your laptop or desktop are regular exhibiting actual color values. It utilizes the same color engine technology found in professional-level color calibration solutions and choose colors from Pantone. The main feature of the color scheme designer is that it can swing from palette to palette using color from visible spectrum. Color combos will enable you to find the perfect color combination for your site. One of the biggest plus is that it is designed for web developers to quickly choose and test web design colour combinations. Color palette generator tool includes combo library, combo tester, combo maker and font color tester. Its combo library contains hundreds of color swatches so, you get color combo ideas. COSAPA is an advance colour palette maker by COLORlover. It helps you to generate the right colour schemes. To save a palette you need to be logged in. It gives you many options to create color palette in the form of preset colors like blend or analogous, triadic, tetradic, complementary and split-complementary. Color Calculator has color wheel where you select the root color. This Color palette generator has 6 harmonies so you can pick one from them and the output will be displayed in the color calculator swatches and on the interactive color wheel. You can tweak your choices by viewing the same harmony with different colors and adjusting saturation . 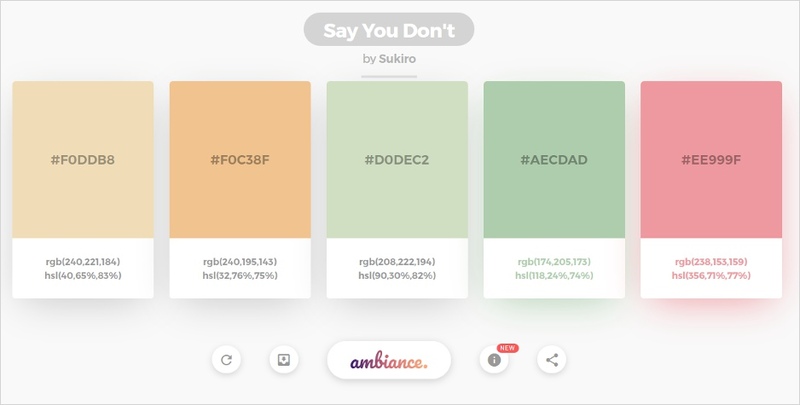 Palettr creates color palette based on keyword, enter your chosen keyword, and appear selection of photos related to your keyword. It creates color palette inspired from each photo. You view photos along with color palette that Color palette generator tool has generated. Tineye has unparalleled image recognition technology. It has Multicolor Engine which is considered as the best color search engine in the world. It is used to work with ecommerce product photography, identifying the colors present in a product and analyzing product images.This Color palette generator is outstanding in identifying and searching by colors. In color blender, you have to first pick a color value format, then input two valid CSS color values afterwards pick the number of midpoints. The result shows color you input , number of midpoint color pick, valid color and the value of those colors. When you click on the square in the “waterfall” the color palette generators show the appropriate value for whichever input is highlighted. Palette Generator is similar to Pictaculous only the main difference is it uploads multiple pictures to compare/contrast the differences. You decide the number of colors you want to use and this color palette generator suggest you which color will be more dominant than the other. The color scheme generator is the best suitable to those who are studying interfaces or photographs. Colorotate takes control of colors with 3D visualisation of the colour wheels and generate more than five colours in a single scheme. This Color palette generator has tools for making precise edits, adjusting with blends and generating fresh ideas with color schemes. It is a color scheme designer that works well with photoshop, it immediately updates the background and foreground colors and palettes are sent to your desktop. The Color App has zoom in where you can get large grid of colours. It allows sampling of colors, finding out the Hex, RGB and HSLA values as well as generate color palettes. You can save your colors and visualize them in different ways. When you are done with colour palettes, export them to the Adobe color panels and Mac. Colllor creates a consistent web colour palette with just a few clicks. One important feature of this profesional color combination generator is to help in finding the exact value of the darker shades of any color. This is a huge step towards professional looking theme. It has numerous variations to choose from such as tones ,tints and color shades. Flat UI Colors has set of 14 color palettes and offers 280 colors for your presentation, design and projects. What you have to do is copy/paste the hex code right into CSS Stylesheet or into Photoshop. In result, it gives you a handful of existing flat color palettes. The man behind “Check my Colours” is Giovanni Scala. His main motto to create this color scheme generator is to see the foreground and background colour blend of all DOM elements and to decide if they provide sufficient contrast when viewed by someone having colour deficiency. 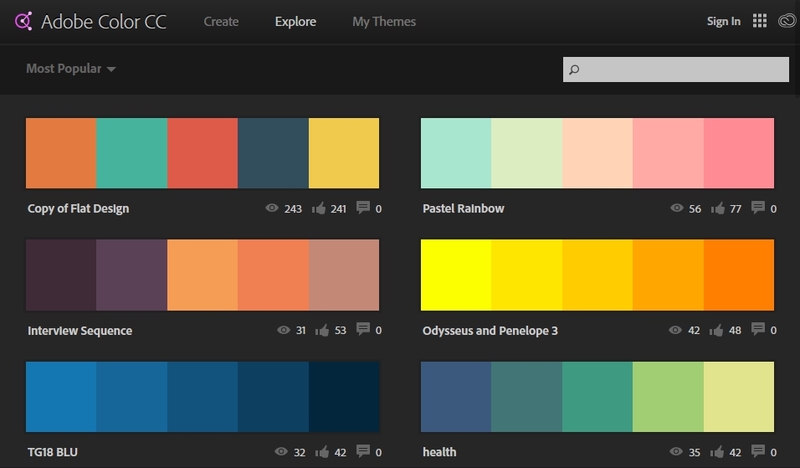 If you want matching color palette for your existing site than this tool will well suit you. 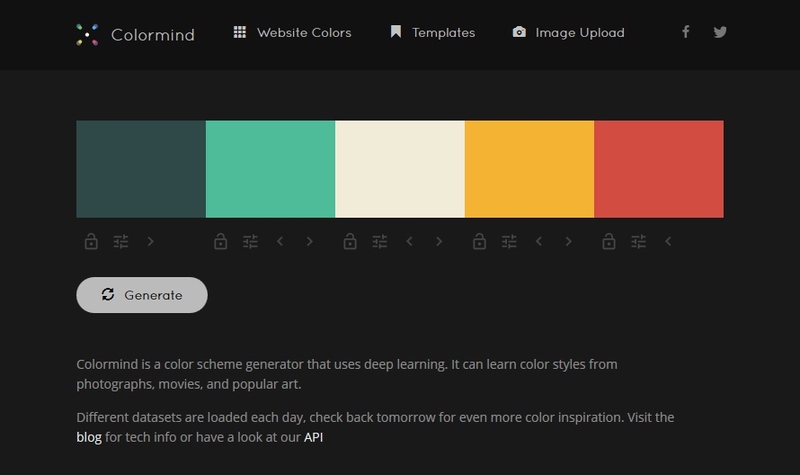 This high quality color palette maker suggests you what colors would go best with your site. You insert in a hexadecimal colour value, and the Hex will return 3 additional colors that match the original color of the site. In colormod, you just choose single color from given widgets area. You input a starting value and get an automatic conversion. It is a color scheme generator which grants you to select your own colors and get the colors corresponding RGB, HSV and Hex values. This super easy color palette generator is evolving into the fastest and compatible DHTML color picker. Colr.org is a color palette maker dedicated to those people who like to fiddle around with colors. It’s a jungle gym for color scheme ideas. This color palette maker lets you see the range of colours available within an image. Colorgrab generate color palettes from image. You have to paste the URL of image that you’d like to analyze, and the site will grab the image. As a result you will get the most suitable color palette derived from the given image. Graybit was created by mike cherim and jonathan fenocchi. Later, it was purchased by joe dolson. You submit URL of web page that need to be converted to their grayscale equivalents and outcome is displayed on your web browser. This is a simple among all color scheme generators that exactly does what it name suggests. 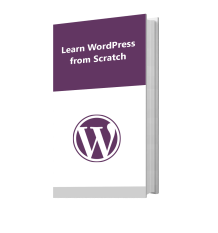 It works best on the site that make use of cascading style sheets. Contrast-A is a color scheme designer which lets you play with color combinations and test them under the accessibility guidelines to generate custom color schemes. It displays the result for normal vision and simulates the colors and results for different types of color deficit. You can experiment with slider and color pickers, until you get desired results. To save your creation press download button. The application can be used in your css file or as pattern in Photoshop. 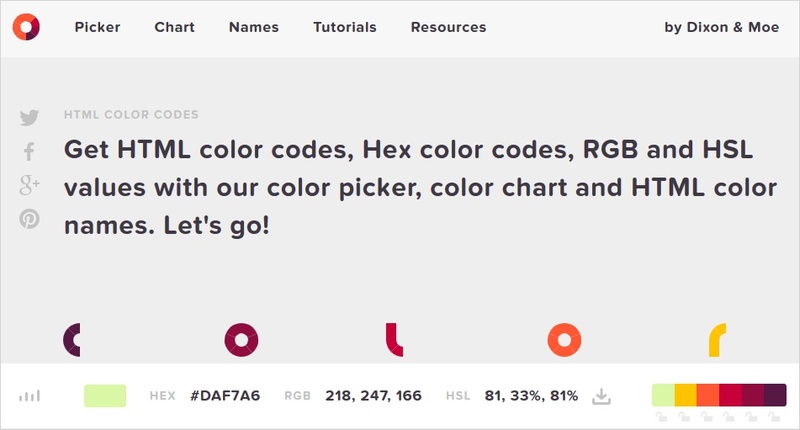 In Color scheme generator, you have to enter or paste base color in Hex code to create color palette. You may choose from various given color combinations categories such as Split Complementary, Double Complementary, Monochromatic etc. Colorfavs where you can generate and discover new colors and palettes for your websites, apps and other projects. It is an innovative colour palette maker that create color palettes from images. It has a gallery to check for colors and color schemes created by other users. The pick of the bunch is its UI design. Shutterstock Spectrum enable you to explore image palettes and generate color combinations. You need to pick a color or browse color palettes. The result will be super cool color combination.The pleasant aspect of tool is that images are displayed on large screen. With colrd, you create color palette and share your inspirations with world. One of the color palette generators tool biggest pluses is that it shares tons of beautiful patterns, gradients and images. You choose image you like then, insert it into this colour scheme generator. This Color palette generator creates color palette derived from image given by you. 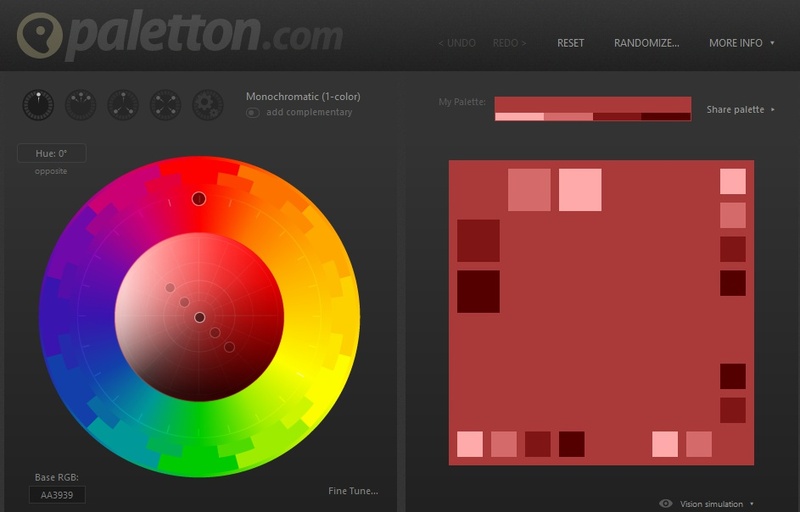 It is a useful tool and worth’s visit to create color palette. You enter the color and click on random color to find colors that best suits your goals. The main purpose of the colour scheme generator is to help you make tweaks to the existing color schemes. It is of great help in finding the darker and lighter colors based on the any color. This Color palette generator tool is most suitable for hover states, gradient, border, etc. DeGraeve color palette generator is free, high-quality, web-based tool that is easy to use and does its work quickly. You put the URL of an image online, and then it create color palette related to image you have chosen. You choose image then paste the URL of the image. Color palette will be generated on the base of the image’s primary color. Tool displays color scheme in various ways: light,dark and medium. It also generates photoshop swatches and CSS styles. Color schemer online lets you enter an RGB or HEX code to get color palettes. The most favourable part of color scheme designer is that you can darken or lighten the generated color scheme.The application can be downloaded on both Mac and PC. You select any color to edit or get random from ColourLovers. Next, choose overlay color and adjust the intensity. It helps in building cohesive color schemes. It provides uniform look to the color palette. Color Palette Generator allows you to upload or choose a photo and it will automatically create color palette based on the colors in the given photo. The created color palette can be used for various purposes like website designing, art projects, etc. Sip app create, edit, organise and share colors. The app enables you to customize color format and it generate and shares new ones. It’s “shortcut” feature is really useful, it offers you to pick and use colors faster. It has touchbar to Interact with your colors directly. Web colour data gives color palette used by popular websites. 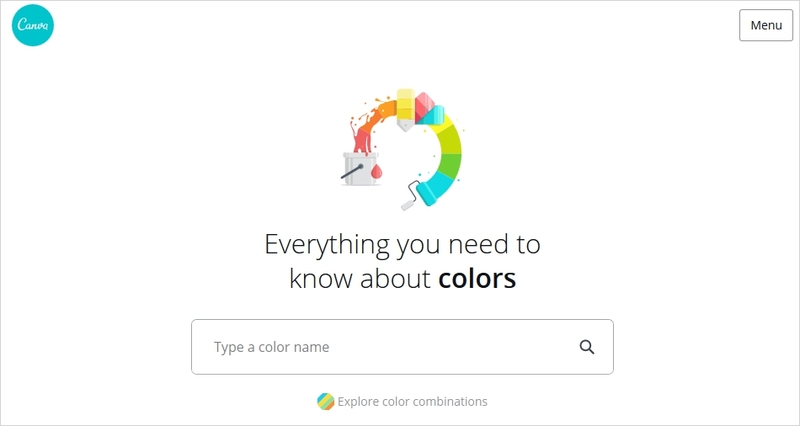 You enter by using color wheel. Above all, it also give options to break down color amalgamation of the website. PHOTOCOPA is an advance color scheme designer by colourlover. The generated Color palettes are photo inspired. You have to upload a photo from web then put it to the gallery for latter use or keep it as inspiration for other users. Colorion has three main options : base colors, gradient buttons and image to material palette. Further, palettes has full color, material design and flat UI design. You click on color to get matching color palette. Color palette generator comes with search bar in which you can find root color and related palettes that best fits your goals. Material design palette works very fast, you select two colors and this color palette generators takes care of the rest. As a result it creates eight harmonizing colors. Apart from the palettes, it also has colors and icons. Color safe render designers with beautiful and accessible color schemes based on WCAG guidelines of background and text ratios. To use color palette generators you enter background color, then choose styling of your text. Color palette generator also has text editable option. To get final result click on the create color palette. It will create color palette that blend perfectly and lend you high contrast up to the WCAG guidelines. In Design seed, color palettes are already created for you. Image-inspired palettes are not created with the help of a computer color-picker. The human aspect of these color schemes make them more inspirational. In Color supply, you choose one main color and then select the style from : Analogous, Triad, Square, complementary and split- complementary. Color supply is a colour scheme generators that choose hues and mixes then, sees which color best suits you requirements. It is famous among new color palette generators. Material design is a google product. It is making headway within the design community. 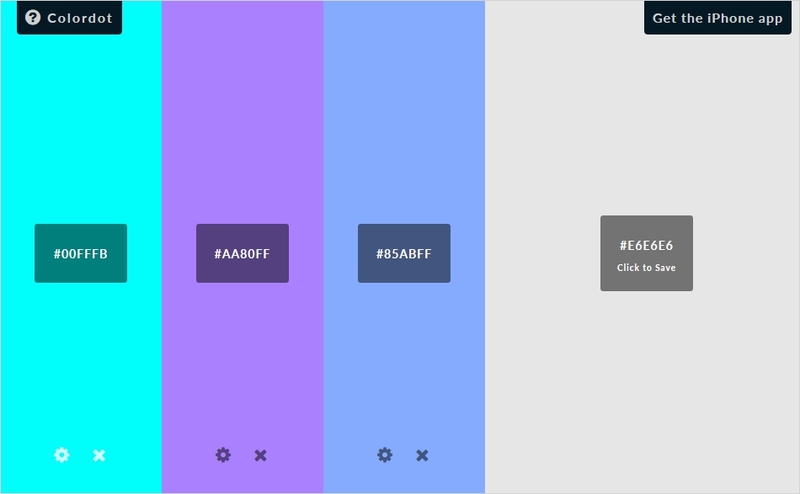 A cut above the rest is color palette generator’s clean and easy UI . Cardstock is the main part of material design. Color palette generators tool is focusing on the universal accessibility. ColorDrop’s color scheme gallery has various combinations of flat colors. You select the color palette. You can also copy the hex/RGB codes of the colors. BrandColors has collection of color code of the official brands around the world. 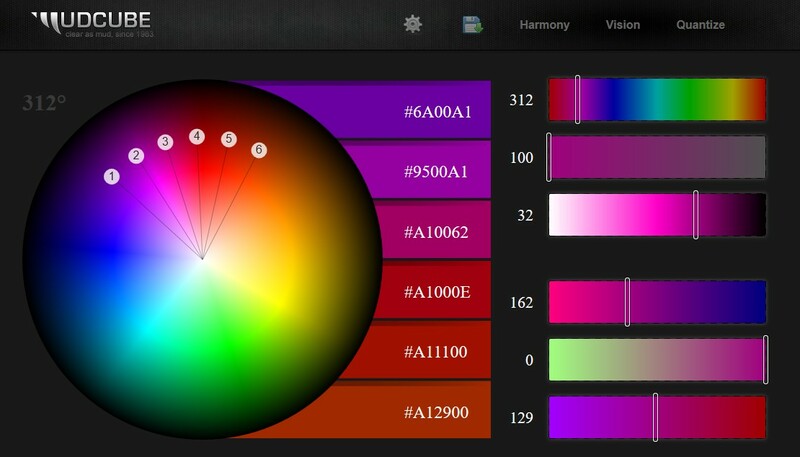 Color palette generator provide information what colors are used by the leading brands. Red and Blue are more popular among the top brands and startups. Color selection is time consuming process and needs a lot of tweaking to get just right. Templatetoaster website builder has provided the list of color palette generators that will provide you enough ammunition to be better prepared to handle color scheme challenge on your website. I hope these color palette generators will make your work easy. Which Color Palette Generators you use? Let us know in your comments. I will include it in my article your color palette generators if they worth visit. 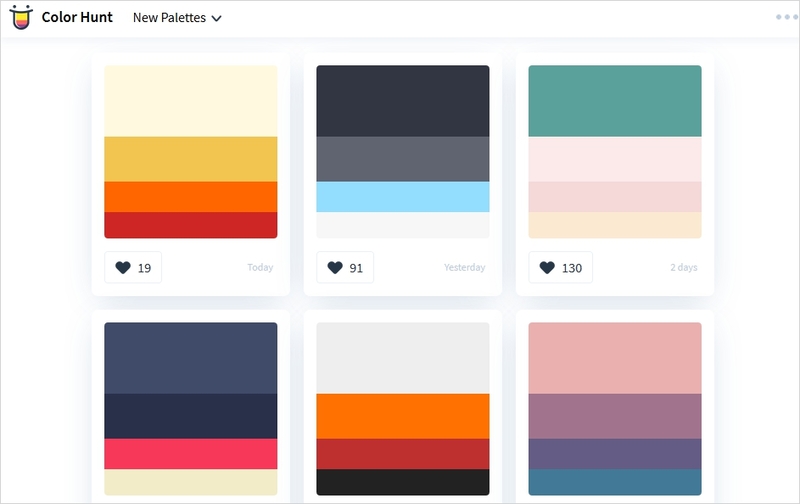 Try some of these color palette generators to choose the best one. Varnoorjot is fond of writing and has good functional knowledge of Web Design. She joined TemplateToaster Blog to mix her words with technical subjects.